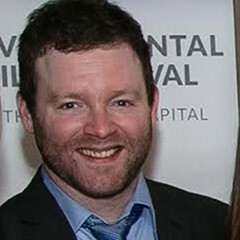 Christopher Head, the Festival’s Managing Director since 2008, is serving as the Festival’s Acting Executive Director through the 2016 Festival. Chris’s background includes a degree in Film & Media Arts from American University, production work at Story House Productions in Washington, D.C., as well as a true passion for and impressive knowledge of film. Chris oversees all aspects of the Festival, from working to obtain the best environmental films, negotiating with filmmakers from all over the world, coordinating screening logistics with the Festival’s many and diverse venue partners and overseeing day-to-day operations at the Festival’s D.C. office. You wear a variety of hats in the DCEFF office as Acting Executive Director. What part of your job excites you the most? I really enjoy the collaborative nature of the Festival and working with our huge variety of venue partners. I have met so many wonderful people who are passionate about their jobs and who care about sharing such strong films with the D.C. community. What are your priorities when envisioning the festival as a whole? It’s important to have a well-rounded program with diverse representation. We must consider many factors when selecting from the large number of films submitted to the Festival each year, including venue choice, speaker availability and premiere status. Paramount to this process is making sure a wide variety of issues are covered and only the best films are shown. Are there any misconceptions about the festival you’d like to set straight? That it’s a “niche” festival. The environment is such a broad topic and it’s necessary to define it as such. The films we show represent an incredible diversity of issues and we’re proud to be able to address such an extraordinary range of interesting themes. In 2016, we’re looking forward to presenting a strand of our program that focuses on parks and other protected areas not only in the United States, but the entire world. What kinds of otherwise underserved films do you give exposure to through DCEFF programming? DCEFF represents an amazing opportunity for audiences to watch films that they would never have a chance to see otherwise. We present commercially unavailable films that might never be shown in D.C. if not for the Festival. This is one of my favorite things about DCEFF and something we think about every day.